A blog for all people who want to learn interseting things about human,inovations,science,space,acient,biography,etc. Music is mysterious stuff. It affects us in a way nothing else does. It may be that the brain contains special neural mechanisms dedicated to processing this special sort of sound. 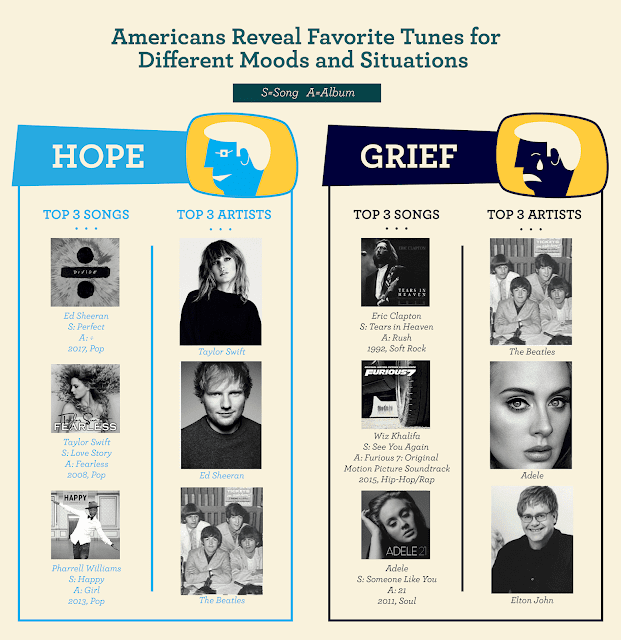 We know that studying and listening to music can enhance our learning abilities, but we don’t really understand how music touches us so profoundly, except that it’s believed that we make strong, visceral memory associations with it. For most, though not all of us, it’s a big part of our lives, and it’s an amazingly effective tool for reacting to and managing our moods. 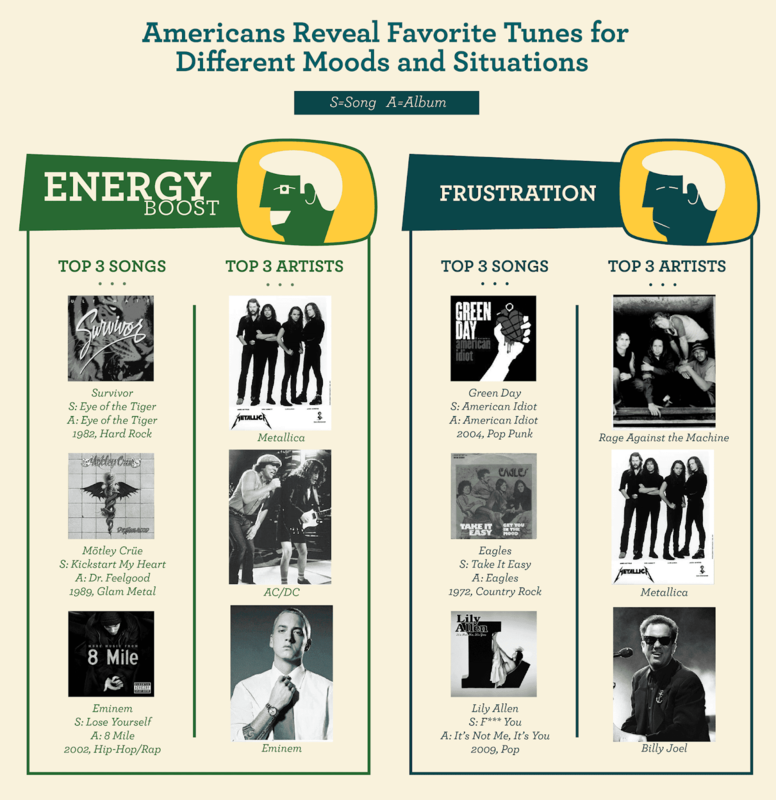 Family Center for Recovery (FCFR) surveyed 1,455 Americans about music and created Good Vibrations, a collection of intriguing infographics depicting their musical tastes and the manner in which they use music in their lives. Spoiler: Music’s use is maybe the most interesting as self-medication when vibrations aren’t so good. 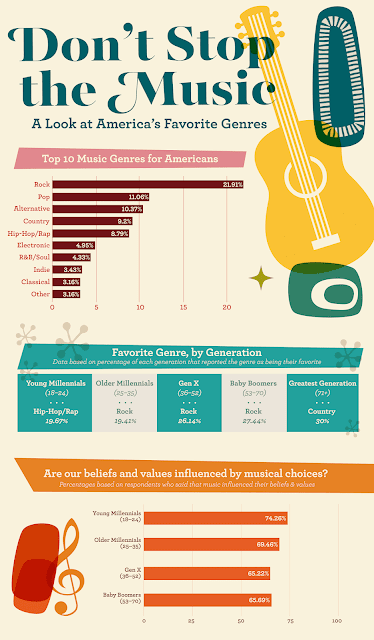 According to the survey, America’s current favorite musical era is (was?) the 1990s, with 22.1% of respondents choosing it. Next up was the 1980s at 19%. 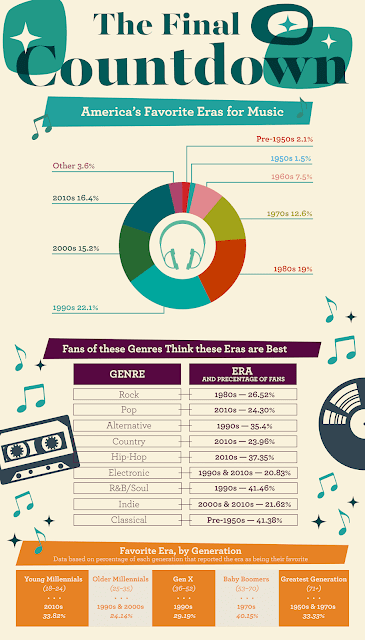 As you no doubt have discovered in your own tastes and the tastes of your friends, your age has something to do with the era you favor, and at the bottom of the visualization you’ll see exactly what period your peers prefer.Finally, there’s a handy list of when to go for best of each genre. If R&B/Soul is your jam, it’s the 1990s for you. Interesting, for the majority of genres, now (the 2010s) is the time for the best music. Or maybe we just have short memories. Far and away, we’re rocking in the U.S.A., twice as much as we are, say, popping in it. 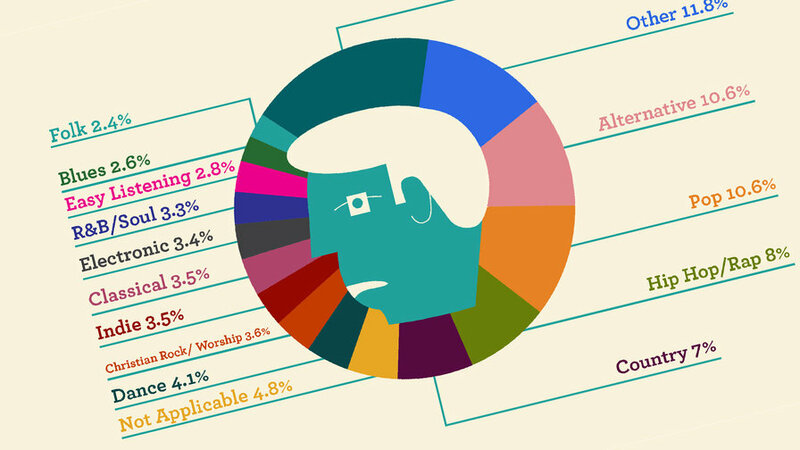 Classical music is way down there at 3.16%, which is better than jazz, which doesn’t even register, relegated to the 'Other' category, along with nose-flute music/kazoo symphonies (we made that last bit up, don’t worry).One of the most intriguing of FCFR’s findings is at the bottom of this infographic: Are our beliefs and values influenced by our musical choices? 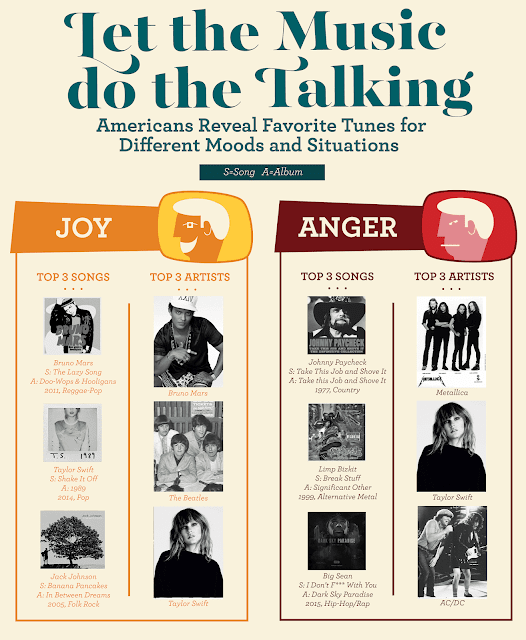 For all generations, that’s a resounding “yes”, further evidence of the way music can dig deep down into our psyches. What would an Internet opinion survey be—this one was conducted through Amazon’s Mechanical Turk—if it didn’t include some hate? Here we go.Hip-hop and rap dominate the Hot 100 these days—it’s the music of the youth—which may explain why it’s the genre with the most haters. (We may also wonder if there’s a racial component to this.) But hey, jazz finally made a list here! Here’s when FCFR’s infographics are the most interesting, with a look at how music affects our emotions, both on its own and as a form of self-medication. 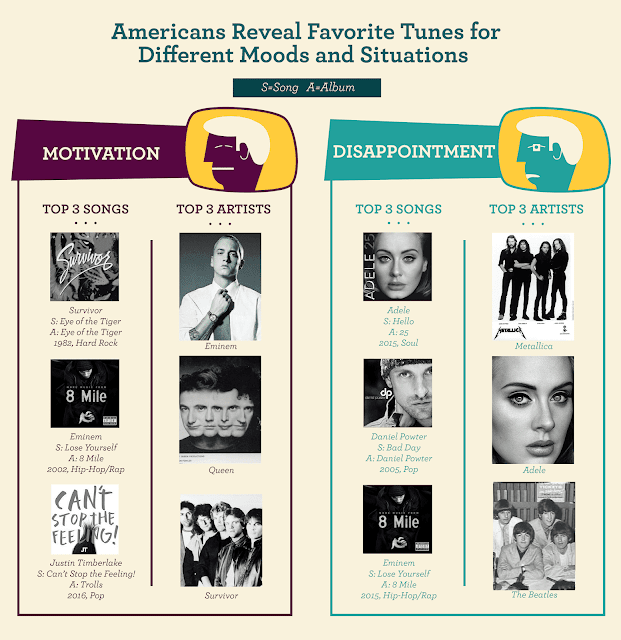 88.71% of respondents said that music helps them combat depression. The top type of music for this purpose is rock at 8%, with pop and alternative tied for second around 10%, and then hip-hop/rap. Country’s not awful for this. Not so good? Blues and folk are the worst, and then everything else. For the 78.32% of those who use music to fight feelings of anxiety, rock wins again at 14.3%, followed this time by classical (8.3%), easy listening (8%), country and pop (7.8%), and alternative (7.4). Surprisingly, the music that works worst, the music that’ll keep you on edge, is laid-back reggae, at 2.2%! Sometimes it’s music itself that brings us down. 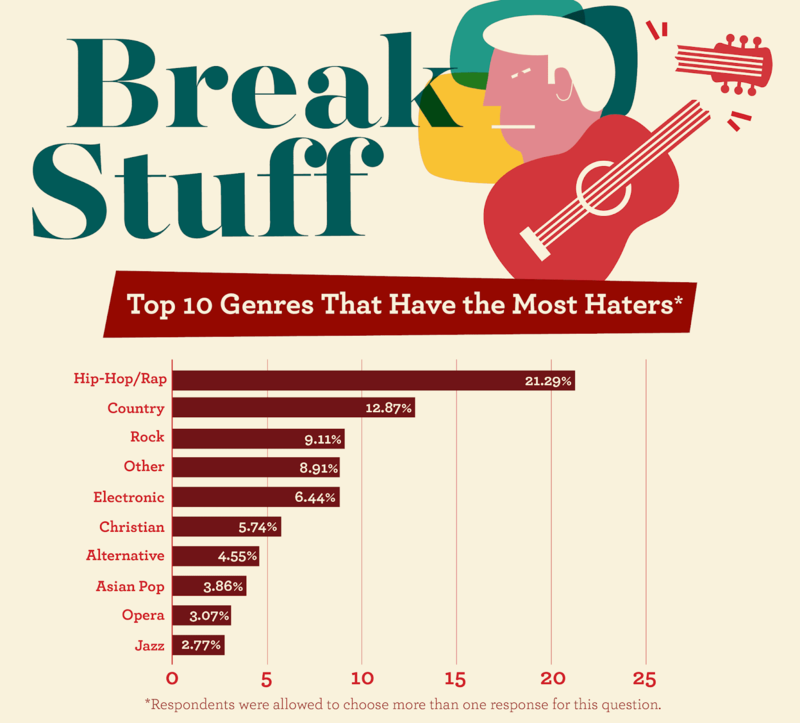 At the top of the list is country music, much of which, after all, is designed to make people drink more beer at bars. Next up is hip-hop/rap, which often deals with the hardships of urban life. Christian music may be designed to uplift, but it does the opposite for many, probably because it’s often about, you know, dying. Maybe the feelings we’ve described so far aren’t yours. Not to worry. If you’re more about joy, anger, being low on energy, are frustrated, unmotivated, disappointed, out of hope, or grieving, we’ve got you. Fortunately, we don’t need to understand music’s magic in order to use it as accompaniment for important events, or a means of recalling memories in a way no other mnemonic device, except maybe smell, offers. Not to mention the way many of us deejay our days by selecting just the right tunes for any given moment. 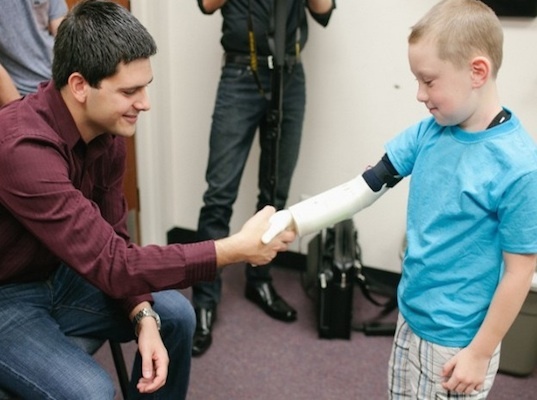 This Customizable Bionic Arm Turns Disabilities Into Superpowers. The Most Powerful Gods And Goddesses In Ancient Egypt! When science and art produce nanosculpture ( Human Sculpture Stands on a Strand of Hair). The Day Humans Taught Robots to Fight Back. Best Quotes of 25 People that created the face of the World as we know it today. The Weird Pit of Magma Beneath Yellowstone Is Still a Mystery. CATALONIA ( Catalunya ) . HARD SITUATION AND CONFLICT EXPLAINED ! A great invention for human health that continues for centuries (BICYCLE).